Biologist, conservationist, writer, publisher, and lecturer, David Hancock has spent most of his life studying west coast and arctic wildlife, and has published scientific and popular papers on whales, seals, seabirds, grouse, and his specialty, the northern raptors. Prior to starting Hancock House Publishers, David was a pilot and wildlife film producer and produced films on these subjects as well as the Haida and other northern Native cultures. His books include The Bald Eagles of Alaska, BC and Washington, Rocky Mountain Wildlife, and The Tlingit:Their Art & Culture. Most recently David was responsible for worldwide acclaim given to the Live Bald Eagle Streaming Video Cam. His current study on The Urban Bald Eagle of Vancouver BC has turned up over 300 nesting pairs in the greater Vancouver area. David does not charge for his lectures to conservation or educational groups but does require travel cost reimbursement and readily accepts an honarilium to the Hancock Wildlife Foundation for more CAM or eagle research. David’s favorite power point presentations are on the “Success and Challenges for Bald Eagles”, various conservation issues or the role of Live Wildlife CAMs in Sceince and Education. David is also available for consultation on getting bald eagles to nest in your area OR on your property. 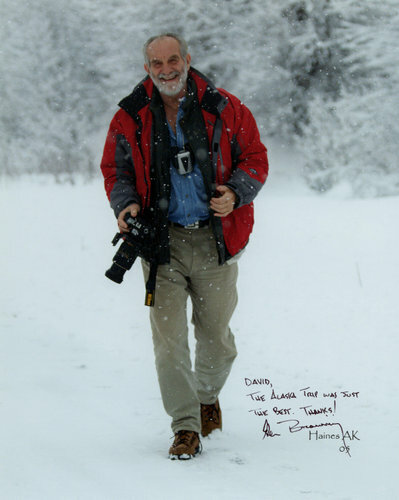 As a publisher/writer/photographer for 40 years he is also called upon to lecture on the publishing industry, getting published, non-fiction writing, and photojournalism.